For aggregate testing, Humboldt provides a large selection of sieves including ASTM testing sieves in a variety of sizes and mesh configuration. These sieves can be used in all types of sieve testing applications, from sampling and classification of soils, aggregates and other powdered and granular materials to specific ASTM standard tests. These sieves are of the highest quality to ensure consistent fit, accurate specifications and durable construction. Humboldt also provides the micron air jet sieve and accessories for analyzing particle size distribution of dry powders. Humboldt also provides a large selection of material sample splitters and screen shakers for preparing test samples from larger batches of material. For specific gravity testing, Humboldt has complete specific gravity bench setups and carries accessories, such as containers, hooks, scales and tanks to suit any need. Also, for those who use the conical mold and/or oven dry method, we have equipment to cover these methods as well. For abrasion and durability testing, Humboldt manufactures a high-quality Los Angeles abrasion machine used to measure the degradation of mineral aggregate of standard gradings resulting from a combination of actions including abrasion or attrition, impact and grinding in a rotating steel drum containing a specified number of steel spheres. We also provide the Slake durabiity apparatus and micro-deval testing apparatus. 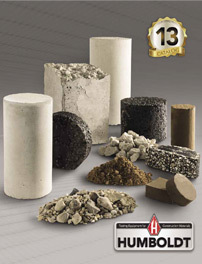 Humboldt stocks a wide selection of aggregate testing equipment. If you have questions or need help selecting equipment, please call us at 1.800.544.7220 or use our Quick Response form. Set includes our deluxe bench, a specific gravity tank kit with heater and circulating pump.